HomeBe a Lead or Co-Lead of the One Planet Sustainable Tourism Programme! Be a Lead or Co-Lead of the One Planet Sustainable Tourism Programme! Support the integration of Sustainable Consumption and Production patterns in tourism sector worldwide, with the mandate of the United Nations. The Sustainable Tourism Programme of the One Planet network is looking for co-leads to manage and support the Programme. Co-leadership is for four years and offers the opportunity to be closely involved with driving progress towards Sustainable Development Goal (SDG) 12 on sustainable consumption and production. The Sustainable Tourism Programme envisions a tourism sector that has globally adopted sustainable consumption and production practices resulting in enhanced environmental and social outcomes and improved economic performance. The Sustainable Tourism Programme was launched in 2014, and has been led in its first four years by the World Tourism Organisation, with the environment ministry of France, and the tourism ministries of Morocco and Korea as co-leads. For the next term (lasting four years from 2019 - 2022), the Sustainable Tourism Programme is renewing its leadership to build on its success and take the network forward in implementing the new strategy ‘One Plan for One Planet’ and the Kasane Call to Action that One Planet Sustainable Tourism Programme developed in collaboration with the network as forward to implement SDG12 in the tourism sector. 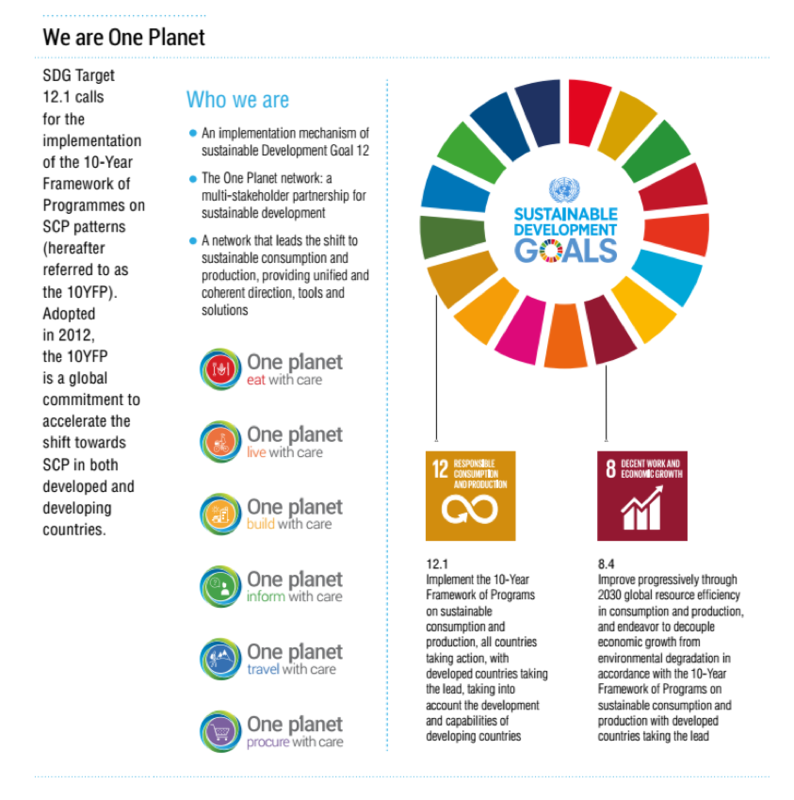 The One Planet Secretariat is therefore calling for expressions of interest from stakeholders to become a Lead or co-lead of the Sustainable Tourism Programme of the One Planet network. Increase the visibility of your organisation’s work on Sustainable Tourism, including by accessing the annual UN High Level Political Forum and other strategic events. If your organization is interested and fulfils the requirements, please complete the application form online, including by attaching the signed letter in Annex 1. The deadline for submitting expressions of interest is 15th of February 2019. If you have any questions please contact the Secretariat of the One Planet network (OnePlanet@un.org) or the One Planet Sustainable Tourism Programme (svitlana.mikhalyeva@oneplanetstp.com). If you would like to learn more about tasks and requirement of lead/co-leads, please click here.